The classic cat and mouse duo travel the world with Granny and Hector, engaging in the usual chase & fight gags while getting involved in the solving of crimes. So, who here remembers the glory days of Kids WB? Before coming to be known as the station that brought you Pokemon, Kids WB carried a handful of shows that have come to be seen as cartoon highlights of the 1990s. The programming block debuted in September 1995, and its first program that morning was Animaniacs, which had already been getting good ratings and reviews over at Fox since 1993. Its spin-off Pinky And The Brain debuted on that initial Kids WB morning, as did the very fun cartoons Freakazoid and Earthworm Jim. 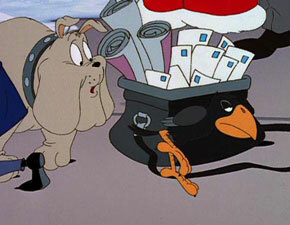 The other cartoon that helped launch the block was a direct spin-off of the classic Warner Bros. Looney Tunes and Merrie Melodies shorts, as it utilized the characters of Sylvester and Tweety in a crime-solving, globe-trotting format. 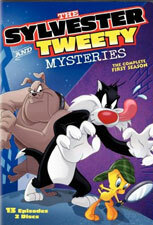 The Sylvester And Tweety Mysteries did last for five seasons (53 episodes), even though many fans have forgotten the show today. Personally, I was thrilled that Freakazoid came out on DVD this year, and I’d still like to see Earthworm Jim again; but with the announcement of a DVD set for The Sylvester And Tweety Mysteries, I basically shrugged. Still, I looked forward to seeing a show that I had ignored when it was first on. I love the Looney Tunes characters, but never went out of my way to catch this show. The concept seemed fun, with a world-travelling Granny carting her pets around solving mysteries, but I suspected that it would be tricky to balance the mysteries with the need to do right by the characters involved, which were known for chases far more than cerebral pursuits. Now that I have seen this DVD set of thirteen episodes, it seems that my admittedly uninformed opinion of the show was nevertheless correct. 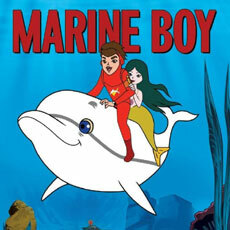 The mysteries are thin and contrived, and the characters really spend most of their time engaging in the same antics that they have been pursuing for the past several decades; except now, the violence has to be toned down for modern sensibilities and the fact that the show is aimed largely at children. That’s not to say that the show is a total loss for classic animation fans. In fact, there is much to appreciate if you are a connoisseur of the cartoons put out by the old Termite Terrace gang. 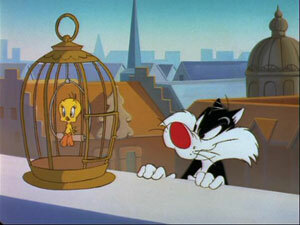 Bob Clampett was the creator of Tweety, but it was Friz Freleng who became most associated with both Tweety and Sylvester when he paired Clampett’s bird with the cat that Freleng had first used in Life With Feathers (1945). After teaming up the two characters, Freleng directed all of their many theatrical cartoons except for the final one. 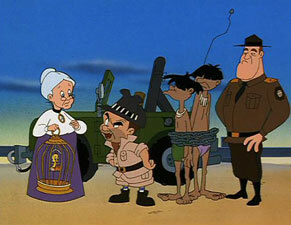 The series was quite celebrated, as the first pairing of Tweety and Sylvester in 1947’s Tweetie Pie (sic) was also the studio’s first Oscar win, and the series went on to produce one more Oscar winner and a nominee. 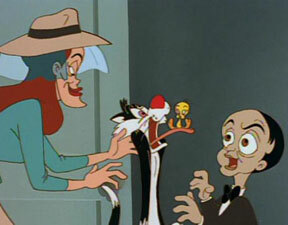 Today, it is hard to think about Freleng without thinking of Tweety and Sylvester. 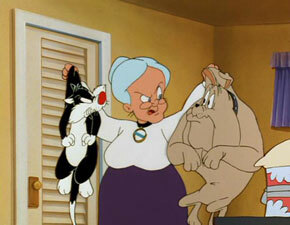 Aside from the cat and mouse and their geriatric owner, Hector the bulldog also reprises his role from the Looney Tunes cartoons, as Tweety’s protector in this show. 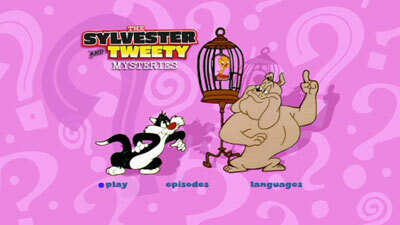 He is a regular cast member, but there are plenty of other cameos on The Sylvester And Tweety Mysteries. The most ubiquitous is oddly Cool Cat, a fairly obscure beatnik-like member of the Looney Tunes gang, who only appeared in the studios’ latter-day output, between 1967 and 1969. 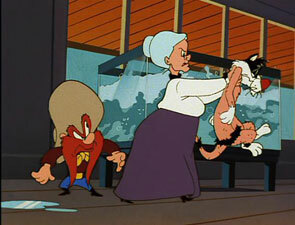 Cool Cat appears in most episode of The Sylvester And Tweety Mysteries, usually in the background, or as a prop, though sometimes also in a more up-front role. Obviously, someone on the show had a soft spot for him. In addition to Cool Cat, the first season has such favorite supporting players as Rocky and Muggsy, Gossamer (the hairy orange thing in the tennis shoes), Peter Lorre (yes, a real person, but he did appear in a number of classic Warner Bros. shorts), and Yosemite Sam. A cousin of Pepe LePew also gets a big role, and spends much of Platinum Wheel of Fortune chasing a skunk-costumed Sylvester. Despite the billing, Granny is the real crime stopper on the program. 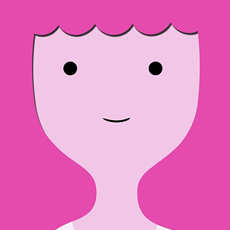 On this show, she is a world-renowned detective, with a very colourful past. 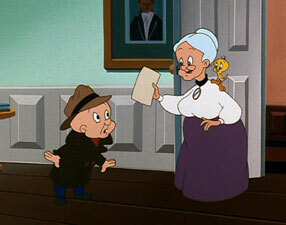 For example, in A Ticket To Crime, she meets up again with a Mr. Fudd, whom she calls “Elmer”, though he insists on being called “Sam” (in tribute to literary detective Sam Spade). His “horned helmet” shadow introduction is very clever, and we find out that Fudd and Granny had a romance in the past! Oh, goodness. Humorously, Tweety comments on the icky-ness of it, but does state that he likes how the lisp-speaking Fudd talks! Okay, so the show has some fun moments. However, when you are crafting a mystery show, it is pretty important to create interesting mysteries; and that’s where this show stumbles. While some episodes are actually decent (well, at least on a Scooby-Doo level), many of them feature mysteries that pull facts out of the air in the final minute, or are solved quite by accident. The worst part is that the plot keeps getting interrupted by the mandatory cat-and-bird-and-dog nuttiness that was done more effectively in the shorts of decades past. The better episodes integrate both elements nicely, but too many of them come off as a mishmash. So here’s my question: Why would I watch this show for the mysteries when the mysteries aren’t effective; and why would I watch it for the chases and beatings when those were done funnier on cartoons already available on DVD? Well, there is the novelty of it all. I’ve seen the classic shorts more times than I can count, so having these TV episodes provides a nice change of pace. The show is a pleasant time-waster, and my kids seem to like it. The show has funny moments, some nice homages to cartoons past, and a few jokes that only older viewers will get. It should also be noted that the second half of the inaugural season is much stronger than the first, and my enjoyment of the show grew as the series progressed. In future seasons, the show would switch formats to including two stories per half hour rather than one, perhaps to address the fact that the shows usually only ever had enough plot to last about ten minutes. The animation is up to the standards of the other Kids WB shows that Warner produced back then. Tokyo Movie Shinsha handled this first season for Warner, just as they also worked on parts of Animaniacs and Tiny Toons, among others. 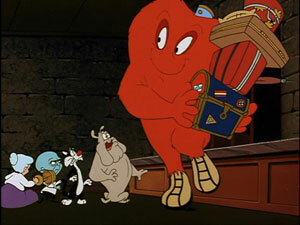 The look is very similar to those other Looney Tunes-derived programs, with typical bulbous-yet angular character designs, thin-line inking, and fully painted backgrounds. It’s not spectacular, but it’s so much better to look at than a lot of the shows that I grew up with in the 1970s and 1980s. The Cat Who Knew Too Much – Contrary to the title, do not expect any Hitchcockian genius here, or even homage. 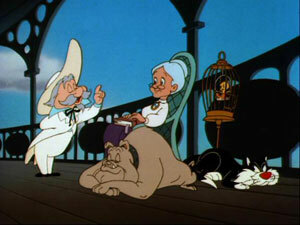 Granny and her pets head to New Orleans so that Tweety can compete once again in a singing competition. Tweety is birdnapped by Rocky and Muggsy, and Sylvester and Hector must come to the rescue. Granny’s role here is less active than in some future episodes, but this premiere episode otherwise shows off the weakness of the show, as the writers had not figured out the best balance yet. Plus, there is really only one suspect to choose from for the Big Boss. Platinum Wheel Of Fortune – This confused episode has Granny competing in the Monte Carlo Grand Prix, while being suspected of stealing a platinum betting wheel. Other than Pepe LePew’s cousin spicing things up, this one is a misfire. Double Take – I like doppelganger episodes as much as the next person, but the plot holes in this story, set in Denmark, are too much. Granny doesn’t even seem to notice when her double shows up, and despite her being wanted for robbery (again! ), no one seems interested in arresting her. This episode does, however, introduce a recurring adversary, her old flame Moo Goo Guy Pan. A Chip Off The Old Castle – Granny and company head to Ireland to investigate the mystery of the missing Blarney Stone. Something Fishy Around Here – The foursome look for Charlene the tuna in Tokyo. B2 Or Not B2 – Granny is invited as a guest speaker on a cruise. 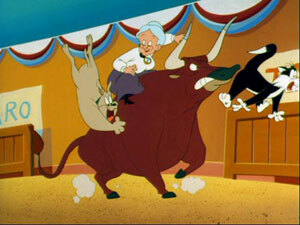 Bull Running On Empty – This time, they’re in Spain for the Running Of The Bulls and a mystery at a museum. A Ticket To Crime – Aside from Elmer Fudd trying to be Sam Spade, there are also versions of Sherlock Holmes, Miss Marple, and Kojak in this English murder mystery. The Maltese Canary – The “real” Sam Spade co-stars in this send-up of the classic Dashiell Hammet story (and Warner Bros. film). Tweety is mistaken for a famous bird in San Francisco. It Happened One Night Before Christmas – In another of the show’s more watchable episodes, we discover that Granny is the sister of Uncle Billy from It’s A Wonderful Life (more or less). So, instead of relying on a guardian angel to help out, Granny is called in to find out whatever happened to that missing eight thousand dollars. Fans of the Capra classic should enjoy this alternative take, while cartoon buffs will thrill to guest appearances by Hubie and Bertie, as well as the mina bird from Chuck Jones’ Inki series. Outback Down Under – Obviously, this one takes place in Australia, where Granny investigates a sheep mystery. It’s A Plaid, Plaid, Plaid, Plaid World – Scotland needs Granny to locate all their missing plaid. Go Fig – Yosemite Sam and his fellow residents of Figdale need Granny to find out what happened to all of their figs. No, this thing is not loaded. No extras are here, except for Trailers on Disc 2, including those for it’s The Great Pumpkin, Charlie Brown, Scooby-Doo And The Goblin King, Popeye And Friends: Volume One, and Smurfs: Season One, Volume Two. Standard keepcase, with a tray to hold one of the discs. No insert. At least an episode listing is on the back cover. The video here is fairly adequate, but problems do crop up, particularly more noticeable on larger screens. Compression problems appear, with jaggies showing up from time to time. The source material is far from perfect, too, with dirt appearing regularly, and vertical lines in the image wearing out their welcome quickly. The surround sound is actually pretty good, providing at least as much sonic interest as what one could expect from a TV show, and sometimes it even surprises with its dimensionality. French and Portuguese Dolby Surround Stereo tracks are also provided; and there are subtitles in English and Portuguese as well, but not in French. The voice cast of the show includes the legendary June Foray, reprising the role of Granny, whom she had played on so many shorts. Joe Alaskey does both Sylvester and Tweety, and Frank Welker handles Hector. Friz Freleng died six months before this show debuted, and the DVD set came out exactly thirteen years after it premiered on Kids WB. What does that all mean? I’m not sure, but those numbers are more interesting than some of the shows on this set. Okay, seriously, it’s a decent program, but it does search for a better balance of mysteries and animal chases, particularly with the mysteries struggling to even reach a Scooby level of substance. It does get better as the first season progresses, though, and those that love Tweety and Sylvester should still enjoy the show, and indeed my criticisms of the show didn’t keep me from still enjoying it for what it was. Some extras would have made the DVD set more enticing for collectors, but for the target audience of kids, the show still finds the mark.